Dr Michael Mel graduated from Flinders University of South Australia in 1996 with a Ph.D. in education and drama. Much of the work through teaching, writing and performing explores and discusses indigenous processes of teaching, learning and performing based around his culture of the Mogei in the Highlands of Papua New Guinea. In 2006, he was awarded a Prince Claus Award for his work in promoting and celebrating indigenous culture and development in Papua New Guinea and the Pacific by the Royal Family and the Government of the Netherlands. 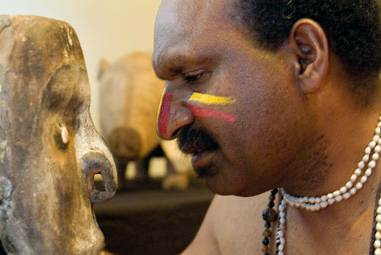 He is an Associate Professor in indigenous processes of art making and art experience and is currently Pro Vice Chancellor (Academic and Innovation) at the University of Goroka, Papua New Guinea.